BUGS can be an invaluable experience for a Mantra Thinker. We are a tiny group and will remain a tiny one. That is because we simply refuse to adopt any of the other pro-white organizations to grow. Dr. Duke showed to me and White Rabbit his thousands of mentions in Google and his giant membership. The time will come when any of you can make your living off a cause. When that time comes you will have to compete, not by spreading a basic concept, but by following another set of rules altogether. That is where truth is forgotten and Doctrine develops. What I am saying here is already understood by BUGSERS. My point here is that what comes naturally to you in BUGS can give a complete new world view. “Why is this information produced?” is the first question we answer here at BUGS. Large organizations’ information has to be distorted as they become big organizations. Those who are converted and paying their dues want something entirely different from what you use to spread the truth. 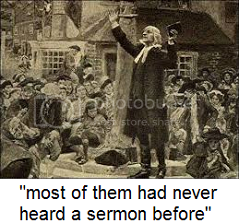 A forgotten reason why the Welsh coalminers and American settlers were converted to Methodism was that when Wesley came to preach to them most of them had never heard a sermon before. The Church of England provided “livings” for its clergy, and there were very few comfortable and assured little “livings” in Wales or Georgia. The Methodist Church soon became exactly the same in Wales and America, a place where a man could settle down and preach for a living. A prison is run by the inmates. The warden may give you a lecture, but no one who survives believes those are actually the rules. You survive by learning the pecking order and finding out, not what is written down, but what those who really make the rules want. Universities are run by the faculty. Their Truth is entirely a product of what those who call themselves “intellectuals” want. BUGS has the most important mission ever assigned to any human organization. But you also have a chance here to EXPERIENCE the basic reality that cripples the spread of any real truth. The most famous book on cloning was published about two months after the sudden announcement that the sheep Dolly had been cloned. The book was written by a top supreme expert and was dedicated to the proposition that cloning was impossible. The publication was technical and only a small number of copies were to be printed for the first and probably the only edition. The author probably expected to be on a few academic panels where he would summarize his book along with other academic authors. Needless to say, the book was a major seller when it came out. I doubt people READ it, but it was something people wanted to own. The author became a very minor sensation on interviews world-wide. It was like Coca-Cola when it switched to new Coke and then back to Classic Coke, a stupendous error that paid of astoundingly. We all know WHY a book that had just been proven wrong was published anyway. But, like most things on BUGS, we need to THINK about this simple reality. Book publishing, from final draft to the bookstore, has always been a process discussed in MONTHS. After you have rewritten portions of the book until you never want to look at the thing again, you send in a final draft, of which a copy is sent back to you. Then you get the Galleys. The galleys are exactly what will go onto the printing press, they look different, though I don’t remember them from almost thirty years ago, the last time I did a book for a major publisher. If you want to make any change in the galleys, you have to pay for it out of your own pocket beyond a low minimum of changes. This is a book you’re getting paid for. The publicity has long since begun. You are doing interviews months before the book hits the presses. The possibility of withdrawing a book from publication two months after all this cost has been incurred could only come up if it was libelous or a point of heresy to our established religion came up. BoardAd is now preparing Why Johnny Can’t Think for publication on the web, while White Rabbit is planning a pod cast, whatever that is, of it. I am one of those who bridges the generations. I published books under the old system, and this one is an entirely new experience. BoardAd is a bit puzzled, I think, when I show the old apologetic panic about some typo that needs correcting. Well BUGS, BoardAd, White Rabbit and the rest of you snotty-nosed young brats out there, my only communication besides the telephone used to be TELEGRAPH ham radio. My mind is still back in the Galley Days. The New York-based publishing industry, like so many others of the Genius Conspiracy, is on its way out of business. I know how us depressives hate good news, but there it is. Those who THINK about ALL the implications of this new age will be the ones who win. But you are NOT dealing with the point. They are WHITE and therefore the next step is third world immigration. Japan’s population fall is the worst on earth, and no one is DEMANDING, I repeat, DEMANDING that they open their high-income borders. But to ask this of Eastern EUROPE is so rutine you haven’t even NOTICED it. You are intelligent and reasobale, but you missed this blatant example of Eastern Europe being asked if it is “ready” for immigration by floating off into a little standard bubble of cliches about American immigration policy. This was a complete surprise to me, and a very happy one. I had my usual problem logging in new. The password refused to copy and paste, so I typed it in, and it refused and then, after a minute, changed its mind. To repeat, this was a complete surprise to me, and a very happy one. SysOps is our CEO, and my only problem is how long she will do it for us. But her sense of honor hopefully will get her to be sure somebody can take over for her before she stops doing the job for us. I am heading for Joizey in a couple of hours and will be there till Monday. READ THE COMMENTS. REPORTS are coming in, and they are CRITICAL! The Mantra is being manipulated successfully, the word “diversity” needs to be substituted in some place, and all this is BASED ON EXPERIENCE. Just a year ago, if I didn’t write something for a day or two, comments would simply STOP. Now the REPORTS and cross-talk keep it going anyway. This is successful management. This is where I wanted to be all these years. Kevin and Dave read my manuscript and got me past several weeks if not months of work. I am now on a complete rewrite they let me to, a rewrite that WOULD have taken me a long time to think out for myself, after several rereads. Rereads are NOT fun for an author. They are particularly painful in the early stages when he has finished the first writing and must read through all the mistakes. He has to look at the lack or order he is going to have to go back and correct. Kevin and Dave have spared me that. Shari and others have asked me for the manuscript. You are NOT off the hook. If you tell a writer you will READ his MS, he has a memory that would make an elephant blush, thick skin, gray color and all. I am saving YOU for the rewrite I am doing. Kevin and Dave have lost their virginity. They have already been introduced to what I have to say, so I need fresh victims. You are currently browsing the archives for the Bob’s Book category.